The Southwest is filled with a rich Native American history and folklore that goes back for many years. Much of that history and folklore can be found in the jewelry pieces that many of these southwestern tribes have made over the years and even to this day. Totems are common occurrences in Native American jewelry and art. They are Native American Indian symbols, often depictions of animals, spirits or natural elements. In the Southwest, some of the best known totems were created by the Hopi tribe. While the Hopi are not known for using stones in their jewelry, they are master silverworkers creating beautiful and sought after designs. Many traditional Hopi symbols are expertly hand carved in sterling silver to represent culturally significant beliefs. While many people know about the Hopi sun symbol and the spiral symbol, many symbols are held closely by the tribe and not talked about publicly. Hopi Silver jewelry is considered sacred. Today, the tribe is known for creating beautiful designs and Native American Indian Southwest turquoise jewelry that features large stones, such as turquoise, against an intricately carved and designed sterling silver backdrop. One of the most well known examples of Navajo craftsmanship is the squash blossom necklace, which is expertly crafted for special occasions and considered a great example of traditional sacred jewelry. Many Navajo jewelry symbols seen today were also used in early examples of art and jewelry. And the Navajo didn’t keep the secret of working with silver to themselves. 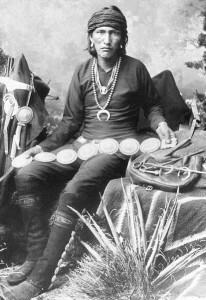 By the time the early 1900s rolled around, the Hopi, Zuni, Acoma and other Southwestern tribes were making sterling silver jewelry and implementing their own styles and traditions. Zuni symbols and meanings play an important role in the art that tribe creates. Native American Indian symbols have always been an important part of tribal jewelry and each tribe implements their own beliefs and imagery into the jewelry they make.